Soon after the catastrophic earthquake in Haiti in January 2010, New York based documentary and adventure photographer Simon Russell and two of his friends, Eddie Gavagan and Stan Tankursley, organized a fundraiser in New York. With the money raised, they travelled to Haiti with as many medical supplies, bottles of water, mosquito nets, blankets and fuel as they coud carry and helped out wherever a local NGO was in need. Along with the miscellaneous supplies and a desire to help wherever they could, they also had a dozen or so soccer balls. Wherever Russell and his partners went, whether it was a small village, community soccer field or just a patch of dirt where kids were playing with a rolled up bunch of rags, they would stop to play a quick game of soccer and give them the ball when they left. It was just 30 minutes for a simple game of soccer but it was time well spent, as it brought smiles and laughter where ever they went. The memories of his pick-up soccer games with kids kept coming to mind, and it finally dawned on him that soccer was the perfect way for him to do something positive and constructive in Haiti. He started with Haitian Peoples Support Project (HPSP), an NGO founded by Pierre Leroy and his wife Terry. HPSP was founded in 1990 as a not-for-profit organization dedicated to helping the poorest segments of Haiti's population, and, in particular, the children. They provide assistance to grass-roots community-based projects such as schools, orphanges, peasant/farmers cooperatives and health clinics. Russell helped out and photographed some of HPSP's benefit events to support orphanages and schools shattered from the devastation of the 2010 earthquake. 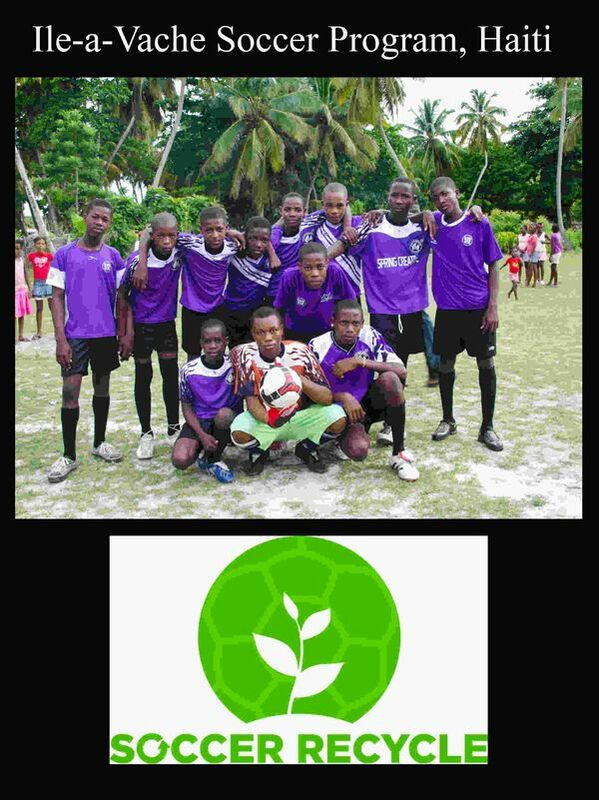 Leroy and HPSP were very receptive to the idea of a kids soccer program and they knew many people in Haiti who would also be able to help. One of those friends that Russell was connected with was Jean Patrick Lucien, a Haitian living in Boston, whose company, Ile-a-Vache Development Group, promotes businesss development, education, environmental awareness, sports and tourism, on Ile-a-Vache, a tiny, pristine island off the South coast of Haiti. Patrick already had an idea for a kids soccer league on the island and was the perfect person to get the project off the gorund. Russell then connected with Linda Ford at Soccer Recycle in New York City. "This program is Linda's baby." Through her program she collects new a gently used soccer uniforms and redistributes them to needy programs in Africa, Asia, Central America and Haiti. "She really is amazing, " says Russell. For our first tournament Ford put together 200lbs of gear - she had full uniforms for four teams of 12 kids, with cleats, balls and pumps. For the second and third tournaments they added goal nets to the list fo gear. Soccer Recycle is basically herself and her own two "soccer" kids collecting gear for this project. This past July was the 3rd Annual Ile-a-Vache Soccer Tournament and this year we were joined by soccer coaches - Eric Yapi Cielenou (coach at Lycee Francais and Manhattan Kickers FC; former professional GK in France and with the Cameroon National Team) and Yannick Diese (coach at United Nations International School and Manhattan Kickers FC; Midfielder, Manhattan Celtic). We distributed uniforms for 6 youth teams, exchanged coaching methodologies, held workshops for the kids and shared the common love of football - The Beautiful Game!